Our new Rotary year is well under way. Please check out the events that we have already enjoyed as well as upcoming events and meetings in this bulletin. The month of August is Membership and New Club Development Month in the Rotary world. As we go through the month of August, I urge each of you to invite at least one friend or acquaintance to a Rotary meeting. As Rotarians, it is our responsibility and privilege to share Rotary with our fellow citizens. There are many charitable minded people in our community who would enjoy being a part of our Rotary World. All they are waiting for is an invite. Will you extend that invitation? Let's look briefly at Peace and Conflict Prevention/Resolution. 20,000 people are maimed or killed by land mines each year. 51 million people are currently displaced by armed conflict or persecution. 90% of casualties in armed conflicts are civilians; at least half are children. 300,000 child soldiers (boys and girls under age 18) are believed to be involved in conflicts around the world. Offer support to marginalized groups that are at risk of violence or persecution. Identify triggering or accelerating factors in the conflict and work to mitigate them. Help children who have been orphaned, injured, or traumatized by conflict. Provide relief to those who have fled areas of conflict. Incorporate conflict resolution and mediation strategies into service projects involving local schools, orphanages, workplaces, and community centers. Recruit candidates for a Rotary Peace Fellowship. Up to 100 peace fellowships are offered annually at Rotary Peace Centers at universities around the world. Pursue projects that address the underlying causes of conflict, including poverty, inequality, ethnic tensions, lack of access to education, and unequal distribution of resources. Participate in fellowship and service activities with Rotary clubs in other parts of the world to promote understanding and peace. As a Rotarian, you have the opportunity to work with Rotary on a local, national, and international level to take action. As part of this focus our Canton Rotary Club currently participates with the other area 5 Rotary Clubs in building a new school in Guo, Ghana. Invite your fellow citizens to undertake this work with you in partnership with Rotary. We welcome in our new Canton Rotary Club board for Installation today and we are led by our new District Governor Paul Sincock and are also joined by our Area 5 AG Russ Jones. President John Kowalski rang us in with a heavy gavel this day at the end two years of support for the Canton Rotary Club. He was present for all events and on time as always, however today was his last day as our Club President. His service to the Club is greatly appreciated, but we are also pleased to have Sue Kowalski (Past President) back as our Club President for 2018-2019. The final numbers for the Beer tent fund raising at the Heritage Park Liberty Fest. Help from the Optimist Club was appreciated. The Interact Club at the local high school may be in a position to help next year in 2019 too, as the event has grown. The "Red Pop" visit to Canada went well and no one was permanently detained at either border. The road trips were well attended and the club enjoyed the experience and will have an easy go of it this coming year. John also wanted to extend a personal 2017-2018 thank you to Bill Tesen, for all his hard and unheralded work on our club planning as Secretary, Sue's continued dedication as Treasurer, Ken's special support for the beer tent and Foundation, and Ansel's articles for the club. President Sue Kowalski then addressed the club and talked about the vast array of different people in the world and how they are depicted by "The Golden Rule" mosaic created by Norman Rockwell at the United Nations. This mosaic depicts different cultures and races of our world, with the words "Do Unto Others As You Would Have Others Do Unto You". As we start the new Rotary year and work to serve the people of the world we are reminded of our theme for this Rotary year of "Be The Inspiration". May each of us be an inspiration to each other, to our community, and to the world around us as we serve our fellow human beings and go forward to "Pursue The Dream" of Rotary following our mottoes of "Service Above Self" and "One Profits Most Who Serves Best". Note that we will be planning next for the Volunteer Appreciation Picnic on Aug. 20th at 6:00pm (Heritage Park N. in Pavilion by Fire Station) and bring School Supplies for the Salvation Army donation. Also, Oct. 1st is proposed for the Golf Outing and Past President's Dinner (more on this later). Beef ravioli today in tomato sauce, it was excellent. The Canton Rotary Clubs Welcomes Judge Thomas C. Cameron from the Michigan Court of Appeals as our guest speaker today. Judge Thomas C. Cameron from the Michigan Court of Appeals is our guest speaker today. July 23rd - Board meeting planned for next Monday, at 10:30 am. Sue will be sending out the agenda. July 30th - District Governor Paul Sincock Visit. Board meeting meet and greet at 10:30 am. 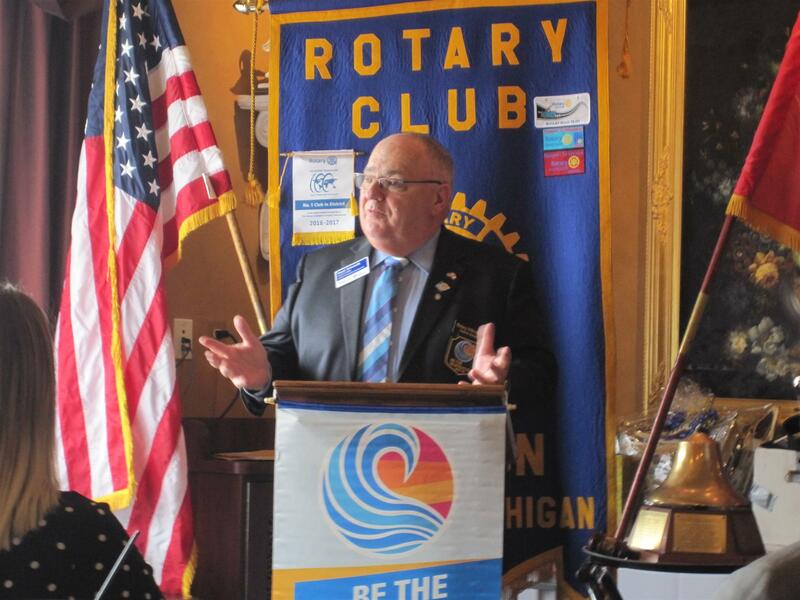 Aug. 6th - The Optimist Club with Barry Burnham and other members will present to the Canton Club, and the Foundation will also present a $2,000 donation to their foundation. Aug. 20th - Volunteer appreciation in the Heritage Park at 5:30-9:00 pm. Setup at 4:00 pm, also the Salvation Army back to school drive will be collected then. Our guest speaker was the Honorable Judge Thomas C. Cameron of the Michigan State Court of Appeals today. Yes, we received some good first hand insight into what goes on in the state judiciary system. We also listened to several current topics and example cases before the courts right here at home in Michigan. He worked previously as a leading prosecutor for the state bar with some surprisingly very high profile and important cases from homicide to human trafficking to public corruption busting, and eventually becoming a Judge on the Michigan Court of Appeals. He also discussed the nature of the position and the conceptual impact of precedence, careful interpretation of law, and the scope of what is placed under review. 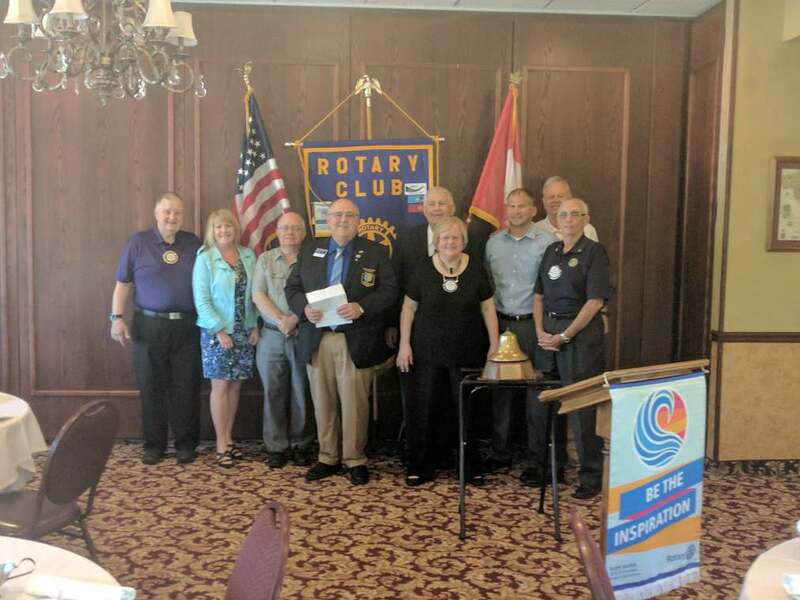 We thanked Judge Cameron for speaking to us today and presented him some small Rotary souvenirs that included our four way test for all our membership. Check out the official MI website at this link here (see third row). Bill Brown was our rapid fire sergeant today. Today's lunch was Chicken Parmesan . Canton Township Supervisor Pat Williams along with Tim Faas were our guests today. They discussed the upcoming Township Millage for the Roads with the Club. Sept. 20th - One Rotary Summit (Educational) at Schoolcraft College. Canton Township Supervisor Pat Williams along with Canton Township Director Tim Faas were our guest speakers today and we focused on the upcoming millage vote for Canton Township. This is an Important topic coming up for elections in 2018 for everyone driving on Canton's roads. Pat first illustrated the Millage proposal history with input of over 7 months and 18 public meetings. He then discussed some of the studies done by Spalding DeDecker and clearly the Millage is recommended and needed by the Township for the health of the roads. Check this out in more detail at the Canton Township's website and the Canton Focus. Today's lunch was excellent pasta with Tomato sauce. 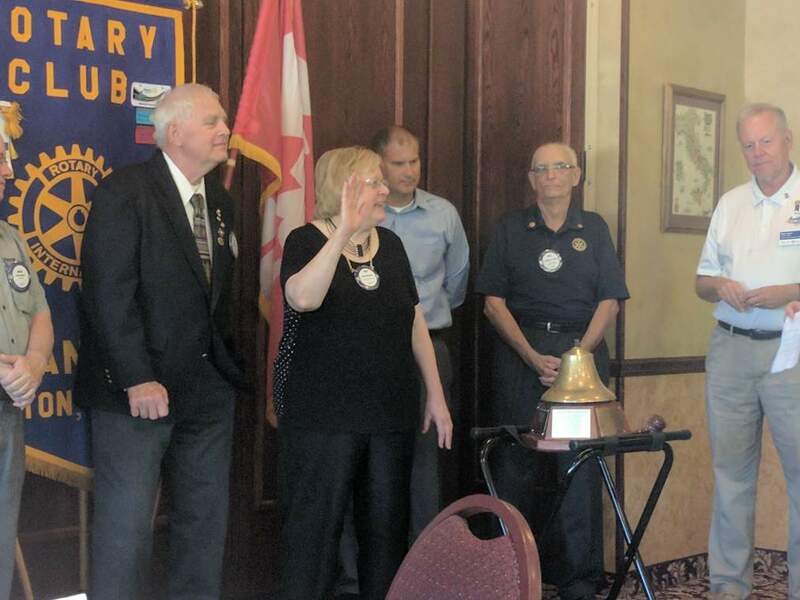 Today our new 2018/2019 District Governor Paul Sincock and his wife Traci were with us for their official visit. 100% club participation in World Polio Day which is October 24, 2018. Every Rotarian Every Year - that every Rotarian in the District contribute to the Rotary International Foundation. Focus on Youth - That the clubs in the District sponsor a total of at least 12 inbound and 12 outbound Rotary Youth Exchange students and assist in Rotaract and Interact Clubs. Rotary Passport - The passport program this year will require participating clubs to sponsor a youth activity to qualify. Rotary Alumni - The goal is to have every club reconnect with five Rotary scholarship winners or exchange students and to re-introduce them to Rotary. What was the return on investment? To have 100% of District clubs participate in the District Governor Golf Outing on Sunday, September 16, 2018. That all clubs will have a vision plan that is less than five years old. Foundation Grants - That all clubs will make use of the Rotary International Foundation grants. That every club embark on at least one new way to promote Rotary and Rotary Youth Exchange. And that every club use social media. 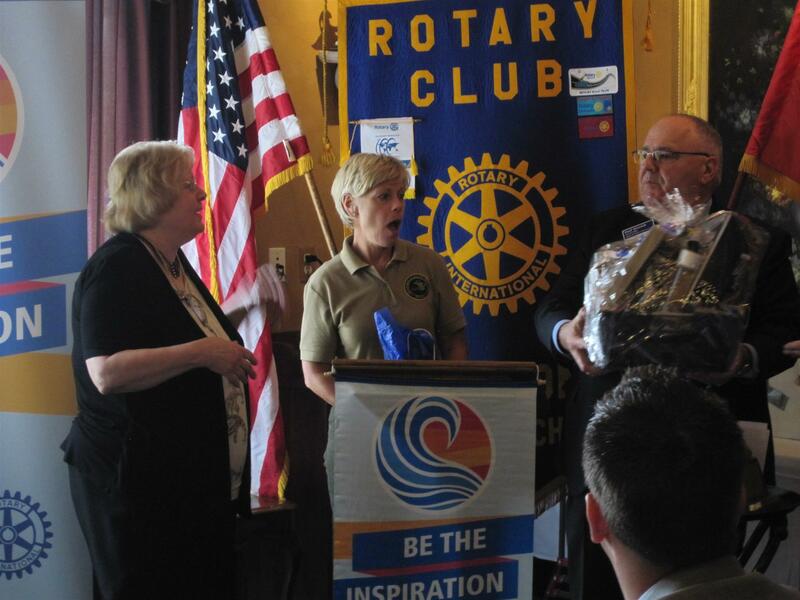 After Paul outlined his goals and plans for us, the Club presented him and Traci with a gift basket, and he presented President Sue with two pair of "Pursue the Dream" socks. Paul enjoys sporting his special Rotary gear such as tie and socks, and Sue will enjoy sporting her new socks throughout the year. We were graced by the presence of several special guests today in addition to DG Paul and Traci: Assistant Governor Russ Jones, District Governor Nominee Noel Jackson, visitor Nate Houghton, and PDG Ed Schulz. While we gathered during lunch, member Abe Vinitski updated us on our projects with the Township. The hydration stations have been started and will be finished by September. One is located near the Clock Plaza and the other is located near the volleyball court in Heritage Park. The benches have now been ordered to go next to the two Free Little Libraries, and the trees will be planted this fall in Heritage Park. Thanks for the update Abe. We enjoyed pizza today and some great fellowship during lunch.